One Man’s Dream, in Disney’s Hollywood Studios, is not an attraction to be rushed through. While there are plenty of ‘Wow’ moments to be had as you move through the exhibit spaces, some of the greatest pieces of history come from taking time to really explore the elements around you. Take, for example, the Florida Conference Room (Project X). This area recreates the sets, props, maps, and studio stage of the Florida Film, sometimes also referred to as the EPCOT Film. Recorded on October 27, 1966, this twenty-four minute film that previewed the Florida Project would be Walt’s last film. In fact, the film wouldn’t even be shown, first to legislators and Florida business leaders, until after Walt’s passing. After its initial showing to the legislative body on February 2, 1967 an almost identical film, with minor changes targeted at the general population of Florida, began being shown across the state. In the reconstructed set of the Florida Conference Room at One Man’s Dream are a few treasures that Disney enthusiasts would love to examine, chief among these are several scripts. Turned to Walt’s introduction to the Florida Film these scripts come complete with editing marks. In addition to these scripts, there is also a transcript from an interview Walt did with Fletcher Markle for the Canadian Broadcasting Corporation’s Telescope program on September 25, 1963. These little details are not the bread and butter of the average park guests, but of course, neither is One Man’s Dream. To truly experience One Man’s Dream, as with all attractions, restaurants, and even walkways within Walt Disney World it is imperative to take a little more time to uncover the world around you. After all, you never know what type of treasure you may discover. The architecture of Main Street, U.S.A. at the Magic Kingdom and Hollywood and Sunset Boulevards in Disney’s Hollywood Studios is magnificent, but these buildings cannot speak for their towns themselves. In order for these sleepy streets to come alive the must be filled with people, and not just guests, residents of these thoroughfares must also be present, and so Streetmosphere characters were born. In the February 25, 1999 issue of Eyes and Ears, Steve Langlois sat down with Rae L’Heureux to discuss her role and about becoming a Streetmosphere character in the article Cast Member gabs about her role as town gossip. The article is full of some wonderful insights and some great history of Streetmosphere, you can read the full article below. Since actress Rae L’Heureux walked into Disneyland Park at the age of 13, she has always wanted to play a part in a Disney theme park show. Rae plays Tabitha Quidnunc, town gossip and “Woman of the Year” on Main Street, U.S.A., part of the Magic Kingdom Streetmosphere entertainment. Magic Kingdom Streetmosphere characters, such as the town gossip, the socialite and the mayor on Main Street, U.S.A. and Ben Franklin in Liberty Square, interact with guests walking through the par, as well as perform at events and conventions. All four Walt Disney World theme parks, as well as Downtown Disney Pleasure Island, feature this kind of live, spontaneous human entertainment. “We enhance the guests’ experience as they travel down Main Street, U.S.A.,” Rae said. “We’re townspeople. We live there, and we talk to the guests as if we either know them or they’re visitors. For Rae, the best part of her job is making magic with her guests. Walt Disney Entertainment holds auditions for these and other kinds of roles in major U.S. cities every year. Streetmosphere performers usually have acting experience in film, television and/or theater. According to Rae, background in improvisation is also important for talking to guests on the street. Not many guests visit Camp Minnie-Mickey these days. The small, out of the way, land in Disney’s Animal Kingdom currently offers a few character interactions, some nice photo opportunities, and one stage show. There are no other attractions in the area, which begs the question as to why most guests would visit this area? The answer is simple if you let your ears do the walking. Set to look like the lake and mountain area of upstate New York, Camp Minnie-Mickey constructs an environment reminiscent of vacation resorts and summer camps where children and families would flock to each summer. While the days would be filled with crafts, sports, and activities, the nights of a camp are always filled with campfires and sing-a-longs. The key item to these evening group gatherings is, without a doubt, the acoustic guitar. While Camp Minnie-Mickey rarely has any activities after the sun has set, it does capture the camp musical heritage in its background music loop, which is comprised entirely of classic Disney melodies strummed on the acoustic guitar. The full loop includes: Feed the Birds, Give a Little Whistle, Heffalumps and Woozles, I Just Can't Wait to be King, I Wanna Be Like You, Little Black Rain Cloud, Mickey Mouse March, Minnie's Yoo Hoo, Never Smile at a Crocodile, Pink Elephants on Parade, Bare Necessities, The Reluctant Dragon, The Walrus and the Carpenter, The Wonderful Thing About Tiggers, Trust In Me, Ugly Bug Ball, When I See an Elephant Fly, Who's Afraid of the Big Bad Wolf, and Winnie the Pooh. For that little bit of Disney magic at home, especially for those who cannot find a copy of the full Camp Minnie-Mickey loop, a new album has just been made available that will make you feel like you are back in Disney’s Adirondacks. Solid Air Records’ latest release is Poppin’ Sherman: A Tuneful of Sherman features fifteen classic tunes from the Sherman Brothers cast catalogue. While the song selection is different, with only some minor overlapping, the soul of music reflects the same spirit found in Camp Minnie-Mickey’s background music loop. Poppin’ Guitars, as well as the Camp Minnie-Mickey loop, have been a wonderful way to wind down at the end of the day and create a great backdrop with which to write articles for the Gazette, and I am sure they will both hold this status for many years to come. Poppin’ Guitars: A Tuneful of Sherman is available on iTunes. The International Flower and Garden Festival at Epcot has its roots firmly in nutrient rich soil. However, for the past several years, the signs of the oceans have begun making their way into the event, making the event more appealing to seafarers and landlubbers alike. 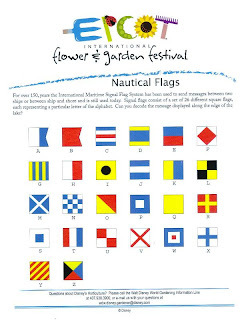 During 2008’s festival, a handout of nautical flags was available to guests wishing to decode the message that had sprung up around the lake in Future World. These floral patterns ended up spelling out the theme of 2008’s festival, Fun in the Sun. Again, in 2009, the nautical flags made an appearance. This time, however, the flags left the flowers behind and used their more traditional form. Hung in banners around the Pirate Adventure Zone, the flags named characters, highlighted activities, and sent messages to eager buccaneers. Some of the messages included “Tie a knot” and “Ahoy Jolly Roger.” In order to interpret 2009’s flag messages, however, guests had to turn to a strategically placed sign rather than a paper handout. In just a little over one month, The Walt Disney Family Museum will open to the public and reveal a world we have only imagined. While many of us have read the biographies, seen the documentaries, and glimpsed into the items Disney has put on display now and then, there has never been as intricate a display of the lives of Walt Disney and his family, than will be unveiled on October 1st in San Francisco. Some of the displays will feature items we, as members of the Disney community, have only been able to imagine and dream about. As our tour begins to wind down, I must continue to thank The Walt Disney Family Museum for allowing all of us these hints of the grand exhibits that are about to be unleashed. As always, Andrea Wang, the museum’s Communications Coordinator, deserves a round of applause as well for including the Gazette and its readers among the recipients of these wonderful previews. With the end of the war, Walt and Roy found inventive new outlets for animation and ventured into live-action production. They developed new package films for theaters that combined shorts and feature-length animated films, as well as movies that combined live action and animation. In addition, the Studio produced the enormously successful Cinderella, Alice in Wonderland, Peter Pan, and Lady and the Tramp, the studio’s first wide-screen animated feature. Disney also produced his first live-action features, including Treasure Island and 20,000 Leagues under the Sea. Concept and animation art from Disney’s films of the period will be prominently featured in this gallery, as well as artifacts from live-action movies, including an underwater camera used in the filming of 20,000 Leagues Under the Sea, and works from Walt’s extensive personal collection of miniatures. Guests in search of home cooking and, if your family is anything like mine, home-cooked-verbal abuse will absolutely treasure their time at Disney’s Hollywood Studios’ 50s Prime Time Cafe. In my past few visits to this Echo Lake establishment, I have seen grown men in bibs, women fed their vegetables, and tattle-tales stand in the corner. I, myself, have been given the nicknames of Sparky and Speedy and been told that no one was going to take my food away from me after cleaning my plate before the other diners at my table had even taken two bites of their meals. Some of my favorite elements of the restaurant, however, have very little to do with food, such as the dessert menu presented on a View-Master reel. The fare itself, however, is also enough to send you back to the kitchen for the recipe. With ample portion sizes of these well-balanced meals, just like Mom would make, you are guaranteed not to walk away hungry. As for that recipe, as it turns out, Mom is willing to share her special meatloaf, and glaze, recipe! So, what are you waiting for? Dig in! Preheat oven to at 350º F.
Dice vegetables (green and red peppers and onions) and set aside for later use. Combine meats and seasonings in a large bowl. Place meat mixture in oiled loaf pan. Bake for 1 hour, or until internal temp is 155º F.
Brush meatloaf with meatloaf glaze, and bake another 10 minutes. Let meatloaf set for 10 minutes, cut loaf and serve. Combine all ingredients until glaze is smooth. When people think back to the early days of Disney-MGM Studios, they are often of two minds. The two camps of thought is that the park felt incomplete or they speak to how this was the golden age of the park. A common, and correct, counter-argument to the fact that the Studios now has less of the mechanics of filmmaking is that, when the park opened, DVDs and their bonus features were still light-years away. Now, most of the features the early version of the park presented guests with would be considered old hat and common knowledge thanks to technology. However, the early years of the park also have some grant us with some of the most magnificent experiences and set pieces. 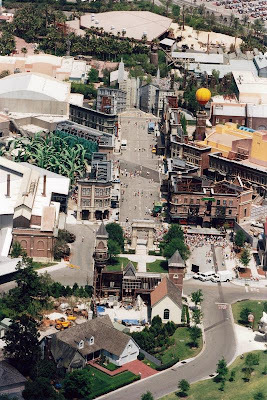 Take, for instance, this aerial photograph of New York Street, as the Streets of America area was then known. Without digging too deeply it shows us everything on along the south side of the park, including the Honey I Shrunk the Kids Movie Set Adventure, Indiana Jones Epic Stunt Spectacular, and the hot air balloon used for MuppetVision 3-D.
Pealing back the layers of the picture, however, reveals some of the truly unique experiences and most memorable scenes from the early years of the park. The gaggles of people clumped together midway along the right side of the photograph are clearly waiting for something. 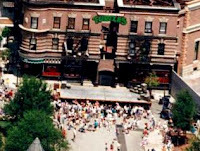 I may very well be in this grouping, as I too waiting countless times for the Teenage Mutant Ninja Turtles stage show which ran from June of 1990 until 1996. Moving the microscope down to the bottom right of the image gives us a sliver of the Bulldog Cafe set from The Rocketeer. Though the movie was not the success Disney had hoped for, this façade was one of the most memorable set pieces from the Backstage Studio Tour, along with the Golden Girls’ house. No matter your thoughts on the first years of Disney-MGM Studios, one thing is for certain, a park that was built to celebrate the golden age and history of filmmaking has had a grand time in crafting its own history. In recent years, Transportation Cast Members have had trading cards based upon whatever mode of transportation (ferryboat, monorail, bus) you were currently making use of. 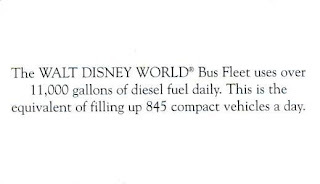 However, these were not the first collectible cards to come from Disney Transport. 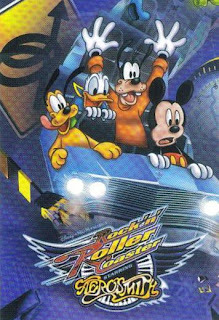 As a part of the 2000 celebration, Transportation Cast Members had business card quality cards that featured a quick piece of trivia on their back. As the cards themselves said, these were to say thanks. 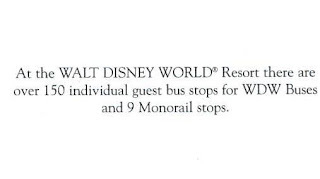 In my experience, however, it is the guests who should be thanking the Cast Members of Disney Transport. Below are a few pieces of the trivia guests could obtain. The stories and legends of Pleasure Island are vast, and though many of the buildings have changed from their original purposes at Walt Disney World, the Imagineers themselves repurposed these buildings from Merriweather Pleasure’s original intent for them. Well, that’s if you believe the tales told around the island. Pleasure Island may now be as deserted as it was the day Merriweather found the area, but a place with so much history can never be totally empty, and at least the homes of the Pleasures still stand. These are the stories of Portobello Yacht Club and Fulton’s Crab House (previously known as the Empress Lily), as presented by the Pleasure Island Historical Society. When Isabella Pleasure finally became convinced that her husband was serious about abandoning Pittsburgh for the wilds of Orland, she grudgingly agreed to move -- PROVIDED her husband built her an estate suitable for someone of their social standing. Merriweather commissioned Howard “Gaucho” Jones to build her the house of her dreams, and on July 4, 1918, the Pleasure family happily moved in. In very short order, Mrs. Pleasure became the leading light of Orlando society, hosting hundreds of tea socials, garden parties, croquet tournaments, and semi-formal dances, including the prestigious “Ides of March Roman Gala”, which raised thousands for charity. She and Merriweather hosted many luminaries in their home, including Teddy Roosevelt, Louis Comfort Tiffany, Samuel F.B. Morse, Robert W. Service, G.B. Shaw, Billy Sunday, Adolph Ochs, and Carl Hubbel. Her soirees were lively affairs, filled with fine food and uninhibited conversation. As she often said to visitors, “If you don’t have something nice to say about someone, come sit next to me!” In 1937, Mr. and Mrs. Pleasure built a new and even larger home where they lived for just four years (now the Disney Grand Floridian Hotel). Originally built as “The Cox-Sherohman Floating Arts Palace, The Most Majestic ShowBoat on the Might Mississippi”. Colonel Tom Sherohman, Sir Roger Cox, and Their Original Dixie FootLighters sang, danced, and over-acted more than 8700 times on this boat. Their most popular melodramas included “The Laughing Octoroon”, “Bertha, the Sewing Machine Girl”, and “The Blackguard!”. Officially retired on October 29, 1909, after carrying President William Howard Taft from Yazoo City to New Orleans for the First Lakes-to-the-Gulf Deep Waterways Dramaturical Convocation. Purchased by Merriweather Adam Pleasure in 1911, re-named that same year for his beloved Aunt Lilly (wife of Pleasure’s zany Uncle Walt), and docked just off his Island in 1912. The “Empress Lily” served as home/guest home/entertainment center for the Pleasures in their early years in Central Florida. Once their home was finally completed in 1918, the “Lilly” was used mainly as a social center and floating summer palace. Every summer, from 1919 to 1928, Merriweather and Isabella Pleasure would cast off from this spot and guide the “Lilly” through the lush, tree-lined waterways of Central Florida. With the catastrophic decline of the St. Johns Aquifer in 1928, the “Lilly” became much less mobile. In fact, the Island’s “Grand Dame” was permanently moored here from 1928-43, when Stewart Pleasure took up residence on the top deck. He held an unending series of riotous parties on the boat, and two of those parties (1943, and 1954) ended with the biblious young Pleasure crashing the “Lilly” into the bridge on the opposite side of the Island. This once proud “Jewel Of The Mississippi” lay abandoned with the Island in 1955. In 1971, the “Lilly” was finally restored to her original glory by the Walt Disney Company. 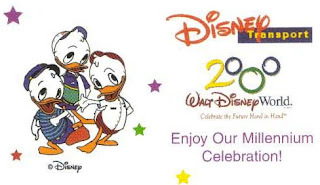 Today, WDW Daily News opened up its voting for their 2009 Web Awards. The categories include Best Long Podcast, Best Short Podcast & Best General Info Site, Best Forums, and Best Blog. I am truly honored to have been selected as a finalist in the category of Best Blog, along with several friends and well-respected colleagues. For those of you wishing to vote for the Main Street Gazette, and voting is open to the general public not just members of WDW Daily News, you can vote here. You can vote as often as you like, from today until September 13th, though they are requesting that you limit yourself to only one vote, per category, per day. No matter the result, it was an honor just to be selected as a finalist. I wish everyone the best of luck! Space Mountain has a long and storied history, from Walt’s grand vision of a rocket through the cosmos as a part of 1967’s New Tomorrowland at Disneyland, to the lack of technology available at the time, to it finally finding its first home in Florida. While originally conceived of under the guise of Space Port, Space Mountain’s construction finally began in 1972 under the creative and nuanced eyes of Imagineers like John Hench, Marty Sklar, George McGinnis, Claude Coats, and Tony Baxter. It is possible that there are more images and concept art for a Tomorrowland that features Space Mountain, and Space Mountain itself, that have been released than for any other attraction in the history of Disney parks. One of my favorite images from all of the work done on Space Mountain includes a who’s who of the team who conceived and created this iconic attraction. Found in the Los Angeles Times photographic archive of the UCLA Library, this photograph from October 1973, ten months after work began at the Florida site, features Sklar, Baxter, McGinnis, and Hench marveling and fiddling with a model. 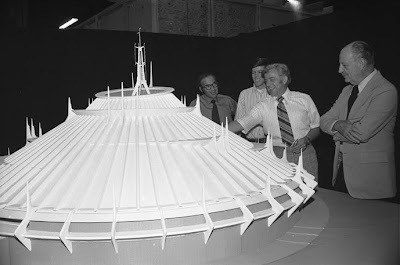 The star of the photograph, however, is the Space Mountain model which still includes the ‘satelloids’ from John Hench’s first sketch of the Space Port in 1964 or 1965. It has been said that, “a dream is a wish your heart makes,” but even I don’t believe my heart could have wished to be where it is today 2 years ago. Two years since I began my stumbling into the world of the online Disney community and began mumbling my thoughts, perspectives, words of (what some might call, if they were being polite) wisdom, as well as chronicling the details and history of Walt Disney World in a little publication called the Main Street Gazette. To put the past two years into perspective, I was not married to my extraordinarily wonderful and supportive wife two years ago. Two years ago I had not yet made many of the very dear friends I talk to, or think about, each and every day (I am not going to list names here as I would surely forget someone and that just would not do), and I had not met the man who would become my closest and dearest friend. Two years ago I had not yet had the pleasure of meeting, talking with, and becoming good friends with the man who would become not only a close friend, but my mentor. Two years ago my brother-in-law was still with us and my sister wanted to plan a trip for him to Walt Disney World, as he had never been, before his cancer became too much, a trip we never were able to make. Two years ago, odds are, a majority of you, my faithful readers, did not know my name. Two years ago I had yet to record a podcast or work on articles for Celebrations Magazine. Two years ago, my office was not yet overrun (though it was brimming) with postcards, paper, photographs, figures, signs, books, and other memorabilia from Disney. Two years ago I started a little blog named the Main Street Gazette in the hopes of sharing some of the history, ideas, knowledge, and tips that have inundated my brain since I was a small child growing up in the loops of Fort Wilderness and the corners of France, Frontierland, Tomorrowland, and Future World. Since that time I have been overwhelmed by the amount of support and encouragement I have found in the community, I have spoken with, and had the pleasure of listening to, people I could have only dreamed of, and I have received a multitude, and more than my due, of praise from those of you who have loved the Gazette. But the Main Street Gazette has not been my gift to you, rather your continued support and readership, kind comments, and astonishing and unexpected letters have been your gifts to me. Thank you to my friends, readers, and loved ones for making the last two years more than I could have ever dreamed or wished for. Thank you for listening to my blathering for the past two years, I hope I can continue to repay, in some small part, the gifts you have bestowed on me for many more years to come. We have talked before about the Eastern Star Railway, and the Wildlife Express to Rafiki’s Planet Watch. Aside from the rich details of the Harambe station and the trains themselves, and the unique exhibits and message of Conservation Station, there is an added bonus of riding the Eastern Star rails that is often overlooked; guests’ ability to view backstage areas without paying for a special tour. As the train begins its journey, guests are taken behind the ridgelines and rockwork of Kilimanjaro Safaris before venturing beyond the often-viewed vistas to the behind the scenes homes of the animals. When originally designed, the animal housing units were built to the specific needs of the animals and the Animal Care Staff. This means the walls have no sharp edges, the animals are provided with fresh air rather than filtered air conditioning, and the only light available is natural sunlight. Among the many units that can be seen from the railway are cheetah, giraffe, white rhinoceros, African elephants, and hoofed animals such as gazelles. Here are just a few of the offstage dwellings visible along the route from Harambe to Rafiki’s Planet Watch. It has just been announced that this October will be the last year for the Race for the Taste 10K and 3K as well as The Twilight Zone Tower of Terror 13K and 5K. Since these races will not be continuing in 2010, this will be runners’ last chance to pick up these medals, including the Race for the Taste’s newly designed finisher medal, before they return to the Disney vault. For more information on these races, including dates and times, courses, room rates, and registration costs, be sure to visit Race for the Taste and The Twilight Zone Tower of Terror 13K event pages. It is Thursday evening, and that means it is once again time to dive into the galleries of The Walt Disney Family Museum. As we kick off our look into the second half of the museum’s ten galleries, I think it is important to stop and take a moment to view these showcases for what they truly are. When open The Walt Disney Family Museum will not allow video-recording or photography within the galleries, therefore, for many of us these glimpses we are receiving may be our first, but also our only peeks for quite a while. That is, unless we find a way out to the Presidio in San Francisco or pick up a copy of The Man, the Magic, the Memories. For those of you seeking more information on museum’s book, it will include 124 images and is being penned by Diane Disney Miller and J.P. Kaufman. The 96 page tour of the life and times of Walt and his family will use its ten chapters to parallel the museum’s ten galleries. Thank you, once again, to the amazing generosity of The Walt Disney Family Museum for providing these feasts for the eyes, as well as the always cheerful Andrea Wang, the museum’s Communications Coordinator. The Disney community is grateful for all you are doing for us! Gallery 6: The Late ‘30s to Mid ‘40s This difficult period in Walt’s life included the deaths of his parents, a studio strike that threatened the company’s viability, and a period when the U.S. military used part of the studio as a base. 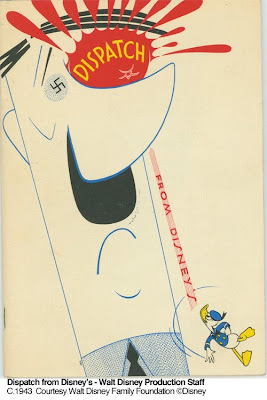 The company released Dumbo and produced training films for the military, public service shorts, and morale-boosting films, and Walt embarked on a goodwill tour of South America to strengthen ties between the U.S. and Latin American countries. 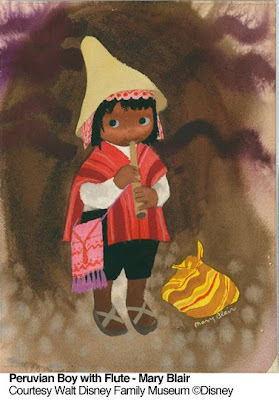 He later produced two Latin American-themed animated movies based on the trip. 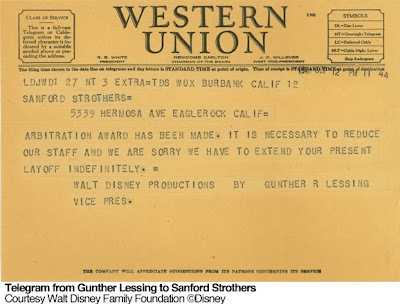 Photos and union flyers from the 1941 Disney animators’ strike as well as samples of Disney films in support of the war effort will be among the gallery highlights. Also on view will be original art from Dumbo and insignias that the Studios created for numerous regiments and squadrons. 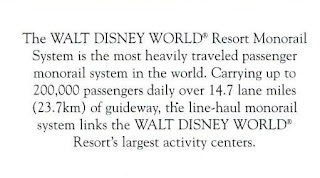 Last week the Gazette’s friends over at Take the Monorail posted a great look at height requirements around Walt Disney World. 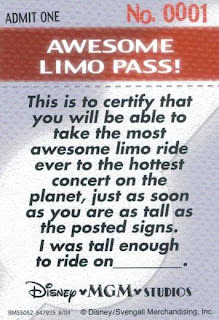 A question that cropped up during the article was whether or not children who were under the height requirements for a given attraction were able to return with a special pass once they had reached the appropriate height and enter using it like a Fast Pass. At the time I had seen some of these passes, but, did not have any to pass along as evidence. As often happens within the Disney community, the answers were out there and came from an unexpected source. Today I am happy to be able to present two of these return passes from 2004. 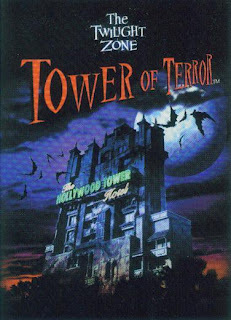 At Disney-MGM Studios, as Disney’s Hollywood Studios was known at the time, pint-sized guests at Rock ‘n’ RollerCoaster Starring Aerosmith and The Twilight Zone Tower of Terror were given specially marked limo passes and Twilight Zone traveler passes. 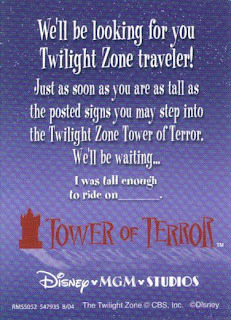 These passes, using Disney’s turn of a phrase, allowed smaller guests to return for ‘the hottest concert on the planet’ or to ‘step into the Twilight Zone’ as soon as they reached the appropriate height. Viewing these items with a teacher’s eye, the most extraordinary piece of these passes is the final line. Here children are able to place the date they finally reached the minimum height, and hold on to these keepsakes as a free memento of their first adventure on these attractions. When Fort Wilderness first opened to the public it was billed as ‘The Original, Imaginative, Innovative, Exciting, Relaxing Fort Wilderness Campground Resort.’ The poster advertisement featured alluring wording to entice guests to stay at Fort Wilderness and experience the steam train, Tri-Circle-D Ranch’s trail rides, Bay Lake, and the transportation to and from the resorts and the Magic Kingdom. Although this poster has not been used in a number of years, and predates Fort Wilderness’ famous dinner show the Hoop-Dee-Doo Musical Revue, it can still be found hanging in the gallery of One Man’s Dream at Disney’s Hollywood Studios. The only artwork on the poster is the Fort Wilderness Railroad, which appears to be chugging off of the page and into the real world. 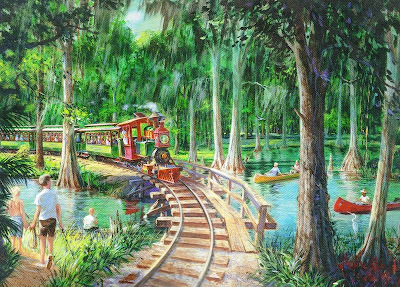 Though the train was the centerpiece, the original piece of artwork featured other Fort Wilderness guests partaking in fishing and paddling canoes through the cypress swamps. The piece was created by Collin Campbell in 1972. An artist who worked on layouts for such features as 101 Dalmatians and Lady and the Tramp, Campbell also toiled on projects such as Disneyland’s Enchanted Tiki Room and Blue Bayou and Typhoon Lagoon in Florida. While his art can generally speak for itself, in The Wind in the Willows Campbell spoke for the animation when he was cast as the speaking voice for Mole. This sign is, perhaps, one of the most overlooked design pieces in the Disney repertoire. I can remember reading, and rereading, this notice every time I boarded one of the ferryboats or motor launches as a child. I imagine when designing this sign the upbeat Mickey Mouse was chosen to keep families calm in the event of a crisis, and the instruction were kept to a minimal word count. As with many children, even before I could read all of the words, Mickey gave me the gist of what was going on in an entertaining fashion. My parents, however, never let me pull out the life vests and put one on. Spoilsports!